The whole concept of adaptation, change, and resistance to change has fascinated me for decades. Over the past few years I’ve had a fair amount of success with change personally. I’ve bounced back from redundancy, successfully shed 26kgs and kept it off, ditched any and all consumption of alcohol, adopted a pescatarian diet, weathered a divorce, moved cities, built daily exercise into my life, lost a parent, house hopped frequently, and launched a new business venture. In hindsight, there’s one primary thing that’s allowed all these changes to happen. It’s also the one thing that if I’d mastered it, would have meant the changes would have been so much faster, easier, cheaper, and painless. It would have also been a lot less stressful for myself, and those poor souls who I adore for their endurance and tolerance of me and my journey along the way. In my experience, the primary thing that holds us back from adapting, staying relevant, and taking advantage of opportunities is our notion of “who we are”. Businesses often confuse who they are with things such as what they do, what they make or sell, or who they sell to. That’s one reason why many businesses fail to innovate to the extent they need to, or invest in new initiatives – choosing instead to keep supporting and resourcing their old tried and true even when it’s obvious they’re on the way out. As individuals we often confuse who we are with our roles and circumstances. We may define ourselves based on our occupation or job; parents; children; as a husband or wife; our income finances and assets; weight, looks; intelligence; athleticism; smoker or non-smoker; and so many other things. When roles or circumstances change, as almost all invariably will… our very identity is challenged. We experience stress and suffering, often directly proportional to the extent to which we are attached to that identity. Even a seemingly positive change will produce a sense of loss. Our ability to adapt, change, and stay relevant in ways that are easier, faster and with less stress and effort is largely a function of our ability to define and re-define ourselves, and to acknowledge and let go of a static idea of who we think we are. This notion is overlooked by most L&D practitioners and change managers, and it’s one of the most significant reasons why people don’t actively engage in continuous learning, and why the majority of change initiatives fail. To help people and organisations adapt, stay relevant and take advantage of opportunities – the sense of identity and what will be lost cannot be ignored. On top of this, attitudes around risk, safety and security need to be redefined, and reframed. That’s why this is a big component of the Adapter Factor workshops that I run. Ironically, it’s those people and organisations who are willing to let go of the old, explore the new, be curious, learn, work together, and trust that they’ll adapt and find a way to make things work for them who will be safest in this world of rapid exponential and disruptive change. These are the reasons why I focus on “conditioning for change” and “optimising for agility” instead of the more traditional approaches. 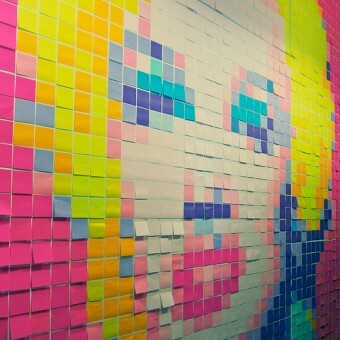 The reason a Post It note can be added, removed and moved so easily is because it can stick without clinging. A Post It note works because it isn’t held on by super glue. There’s a lesson in that for us humans. If you’ve enjoyed this post, we’d really appreciate it if you’d “like” it, and if you think others may enjoy it, please “share” it too. Thank you. By Lisa McCarthy of oAi. – helping people and organisations adapt, stay relevant, and take advantage of opportunities. Web: http://www.optimalagility.com Email: contact@optimalagility.com.